Photonix consists of 4 different exhibitions specialising in laser processing, optical communications, optics and optical measuring/analytical technology. 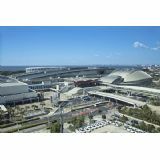 As Japan's largest B to B trade show that plays a key role in technical innovation for electronics, automobile, communications, energy, medical, etc. , the show will be expanding its size.